William Blake (1757–1827), Hecate, The Night of Enitharmon's Joy (1795), watercolour, 44 × 58 cm, The Tate Gallery, London. Wikimedia Commons. In the previous article, I looked at how owls have been used in paintings, with ‘meanings’ of the dark hours, night, wisdom, and learning. The latter two most probably originated from their more ancient association with the Roman goddess Minerva, and by descent from the Greek goddess Athena (or Athene). Athena may go back to an even earlier Mycenean goddess. In archaic images, Athena is often seen with an owl perched on her hand, and there is a suggestion that she may have originally been a bird goddess, nearly two thousand years BCE. Whatever the origins, there is no doubt that Athena then Minerva were goddesses of wisdom, learning, crafts, and skill, and that they were strongly associated with owls. Thus owls became proxied symbols for wisdom and knowledge. Minerva of the Romans also had Etruscan influences, which determined her name: the Etruscan goddess of war Menrva, with origins from an Italic moon goddess of similar name. This may have reinforced her association with owls, and some Etruscan images of her show her shield with an owl on it, although to a certain extent this might confuse her symbolism with that of night. 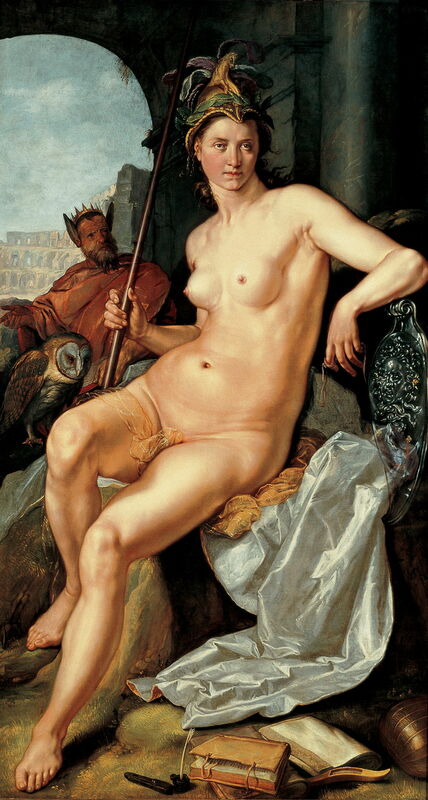 Hendrik Goltzius (1558–1617), Minerva (as the Personification of Wisdom) (1611), oil on canvas, 214 × 120 cm, Frans Hals Museum, Haarlem, The Netherlands. Wikimedia Commons. Hendrik Goltzius shows a classical and fairly complete set of her attributes in his Minerva (as the Personification of Wisdom) (1611): the owl, her distinctive helmet, here decorated with olive leaves, a spear, books, and great beauty. Simon Vouet (1590–1649), Allegorical Portrait of Anna of Austria as Minerva (1640s), oil on canvas, 202 x 172 cm, Hermitage Museum, Saint Petersburg. Wikimedia Commons. 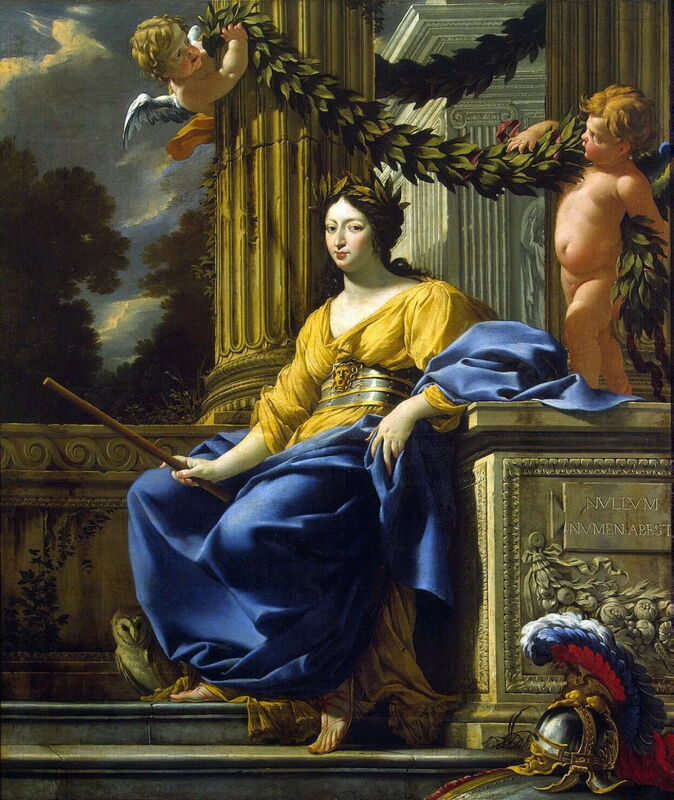 Simon Vouet tucks the owl and helmet away more discreetly in his Allegorical Portrait of Anna of Austria as Minerva (1640s). William Blake (1757–1827), Hecate, The Night of Enitharmon’s Joy (1795), watercolour, 44 × 58 cm, The Tate Gallery, London. Wikimedia Commons. 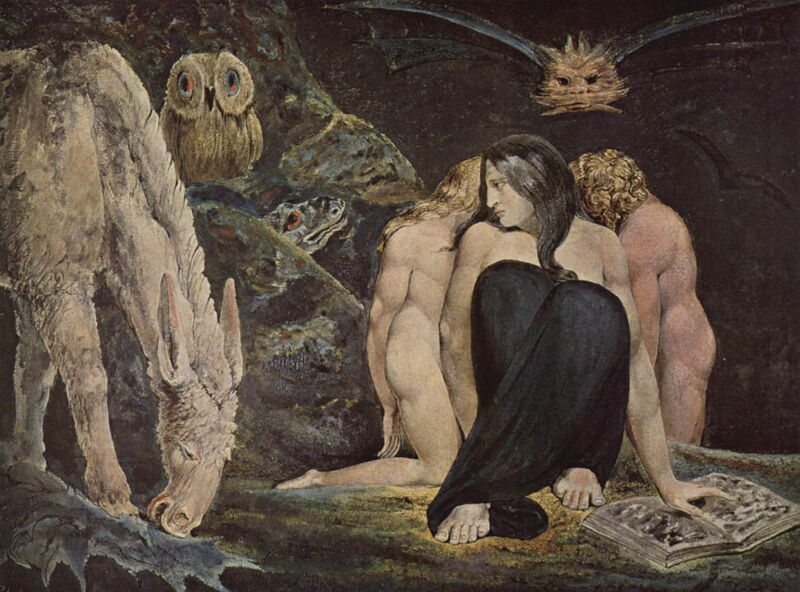 William Blake’s Hecate, The Night of Enitharmon’s Joy (1795) is an altogether more puzzling watercolour. Hecate is the goddess of the moon, magic, and sorcery, and was sometimes shown in this triple form. She was not normally associated with owls, though. Blake may have made that link through night, although several who have tried to explain Blake’s symbols have invoked the owl as a symbol of the false or tainted wisdom that comes with sorcery. The latter does not appear to have much support in the classics, though, and may have been peculiar to Blake’s own constructed mythology of Enitharmon. 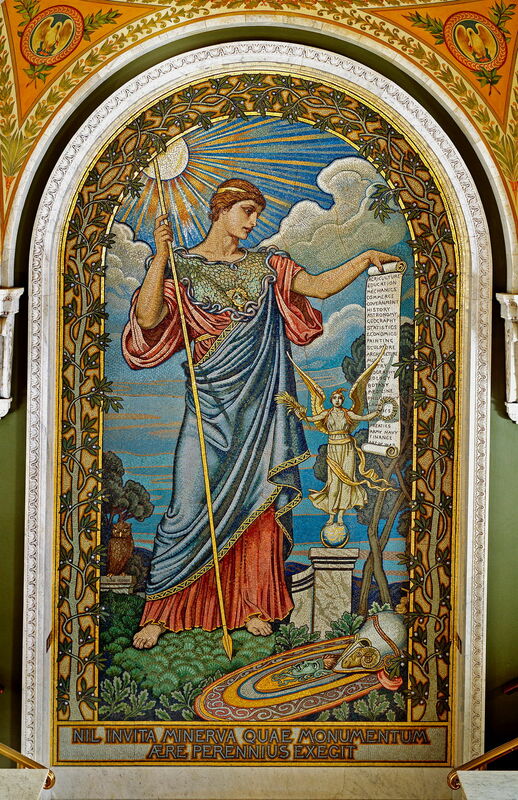 Elihu Vedder’s mosaic showing Minerva of Peace (1897) follows the more traditional line in associating the owl with Minerva of wisdom, and he has even signed this work under his owl. 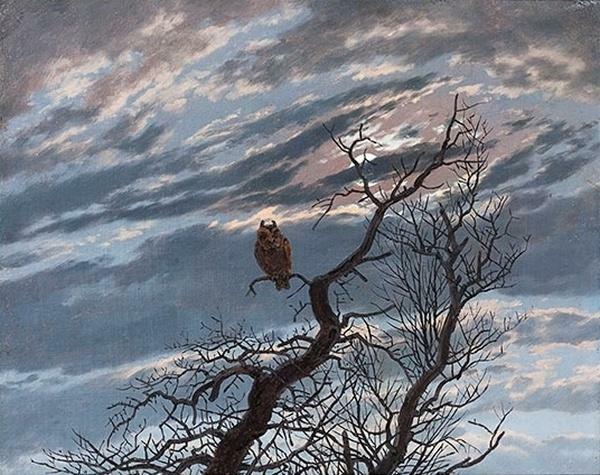 Caspar David Friedrich (1774–1840), Owl on a Bare Tree (1834), oil on canvas, 25.5 × 31.5 cm, location not known. Wikimedia Commons. Caspar David Friedrich brought owls into his paintings in their more usual association with night, as in his Owl on a Bare Tree (1834). But for Friedrich the night was every bit as disturbing as some of Bosch’s images. Thus his owls are not inherently symbols of the nasty. So with the sole exception of Blake, I cannot see any clear association between owls and false wisdom. Owls certainly can be a part of sinister imagery, but through their indirect association with nasty things that happen during the hours of darkness. We finally come to consider Bosch’s drawings. Not too many have survived, but the first remarkable feature is that of these few, two have extensive owls, and a third has one very prominent owl. 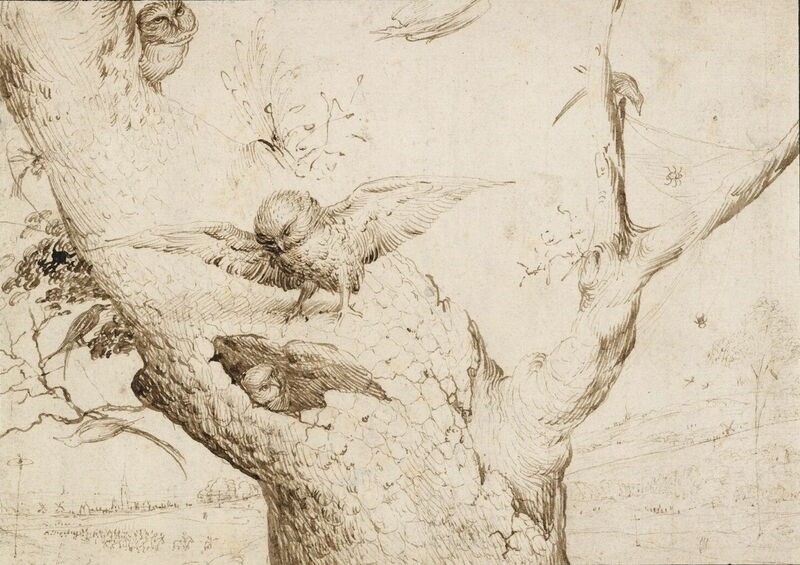 His drawings confirm Bosch’s fascination for owls. The first, known as The Owl’s Nest (c 1505-1516), is a fine pen and ink study of three owls, one of which is shown inside a hole in the tree. All three birds are carefully finished in high detail, but the owl in the centre with its wings spread looks like the focus of this drawing. Some of the peripheral details have a slightly sinister tone: a couple of less finished spiders on the right, for example. The outlined distant landscape at the lower left also seems to show an army massing, much as Bosch showed in some of his paintings, such as the Adoration of the Magi (New York). 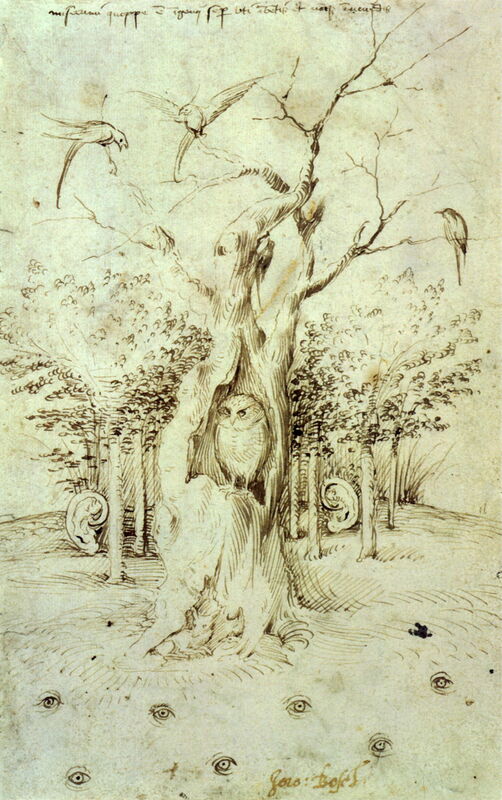 But more generally this drawing is free of menace, and is simply a superb study of those owls and the tree. Hieronymus Bosch (c 1450–1516), The Wood Has Ears, The Field Has Eyes (recto) (c 1500), pen and brown ink on paper, 20.5 x 13 cm, Kupferstich-kabinett, Staatliche Museen zu Berlin, Berlin. Wikimedia Commons. The second, known as The Wood Has Ears, The Field Has Eyes (c 1500), stands in stark contrast. Its single owl stands in the hollow of a tree trunk, looking decidedly shifty, and full of malice. It is out-numbered by other birds, which are more sketchy in appearance. But the most sinister features of this are the two ears stood in the coppice behind, and the seven human eyes laid on the grass in the foreground. Its message is plain, and very disturbing: what you say and do will be heard and seen, even when you are out in the countryside. It could almost be used as a poster for a modern campaign against electronic surveillance. 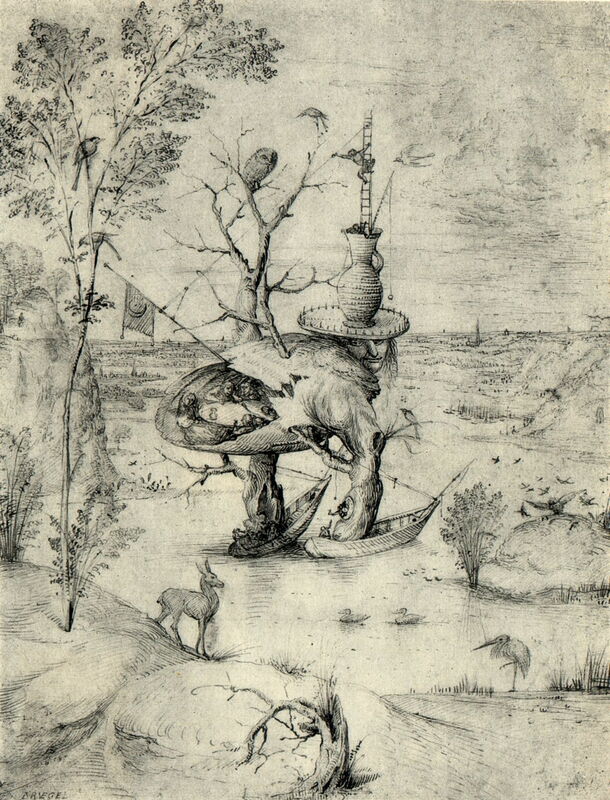 No one knows why Bosch drew this, but it looks very much like the work of someone who is worried that their words and actions are being observed by others. It could, of course, represent paranoia. And it shows an owl as part of that sinister countryside – not an owl of false wisdom, but a spy. The third and final drawing by Bosch is his famous The Tree-Man study for one of the most extraordinary passages in his triptych The Garden of Delights. Perched on top of one of the branches growing up from the tree-man is an owl, by comparison with the people inside the tree-man, a huge owl. As big as a man. In the finished painting, those upper branches were largely dispensed with, and the owl does not appear in that position. In the drawing, its role is unclear – as is much of the content – but it does not appear to be particularly sinister or malicious; it is just an owl. So how are we to read Bosch’s owls, then? I think that we must read each in its context. There is little to indicate in other paintings that owls have any connotation or symbolic meaning beyond those shown above, nor is there evidence that Bosch used them for any generic purpose, except perhaps as a form of graphic signature. I would certainly be very wary about claiming that any of Bosch’s owls should be read as embodying false knowledge. Posted in General, Painting and tagged Blake, Bosch, Friedrich, Goltzius, owl, painting, Vedder, Vouet. Bookmark the permalink.